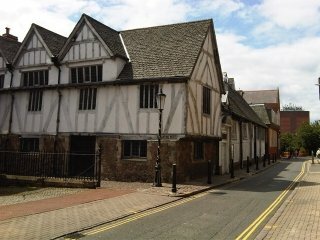 Leicester Guildhall is a Grade 1 listed wooden-framed building, with the earliest sections dating all the way back to 1390. It once acted as the town hall, until a new one was commissioned in 1876. The hall was originally a meeting place for the "Corpus Christi"(which means Body of Christ in Latin). The Corpus Christi were a group of businessmen and gentry who had religious connections and who used the hall for festivals and banquets. Today, the hall is used as a performance venue and a museum. The presence of a police officer has been encountered numerous times, by various people. His footfalls are often heard in and around the main entrance area to what was once the constables cottage. Perhaps the most fearful places are the prison cells, which were used in the Victorian times. Many mediums have picked up on a malevolent male energy who dislikes intruders and makes many people feel depressed, sick and disorientated.